The group ROMONTA is a German success story from Saxony-Anhalt. It has already been producing crude montan wax for 95 years. It obtains the coal that is needed for the production process from its own opencast mine. In 1922, the industrialist Carl Anton Riebeck founded Montanwerke AG to produce crude montan wax in Amsdorf - located between Lutherstadt Eisleben and the university city of Halle in Saxony-Anhalt. For this, he built upon an old patent dating back to 1897, for the technical process for separating so-called montan wax from coal. The area around Amsdorf offered good conditions for this: large quantities of bitumen-rich brown coal. This was formed from palms millions of years ago in the Tertiary period. Their leaves were covered with wax which protected them from drying out and UV radiation. This wax is now found in coal. Now, 95 years later, this large-scale industrial process still exists at the same site, under the name ROMONTA. It is the world’s biggest producer of crude montan wax, even the only one in Europe. Up to 20,000 tons a year can be produced here, and the turnover of the whole group of companies is currently 60 million euros per year. In addition to the substantial domestic sales, the product montan wax is also exported to countries including Japan, USA, China, Russia and the EU states. The company maintains long-term customer relationships, some of which have existed for 95 years. Although the production technology has been improved time after time and montan wax is now produced in a modern, high-tech process, the principle of manufacturing has remained the same. “We extract the brown coal from our own open-cast mine,” explains board member Rena Eichhardt. “It is prepared, dried and wetted with a solvent. In this way, we wash the montan wax out of the coal.” This liquid wax, says Rena Eichhardt, is then prepared in different forms - in cubes or granulate or even already processed at the site - depending on the customer’s wishes. The decisive difference from synthetic waxes is its purely vegetable origin. Its special properties allow its use as a basic material in many industrial applications. It is biological wax, so to speak. The raw substance is a black-brown colour. The long-chain hydrocarbon has a melting point at which the substance changes immediately from a liquid into a solid form. The wax is scratch-resistant and brittle. The properties of raw montan wax make it an all-rounder. 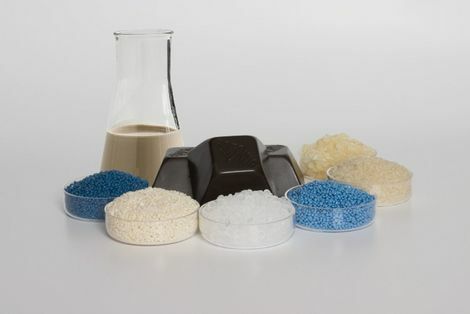 Shoe creams, polishes and lubricants, for example, can be manufactured from it; the wax is used in the hydrophobing of building materials, the asphalt industry and casting. More than 60 percent of the total production of montan wax is bleached. This processing turns the dark untreated substance into a light, almost white hard wax. This increases the range of possible uses substantially. Cosmetics, leather care products, dyes and anticorrosives are just a few examples. The company has successfully made it through some low points. The upheaval after the fall of the Berlin Wall was one of these - 100 million euros were invested after this until 1996. The initial privatisation failed because of fraudulent schemes on the part of the then partners. The second privatisation took place in 2001, in the form of a management buy-out. The ROMONTA group of companies, as it has been called since then, is strongly rooted in the region. It currently provides work for 400 people; the owners and top management also live and work there. From the start of the production chain - the extraction of coal - to the end of the sales process - the paying of taxes - the company is a true success story from Saxony-Anhalt.